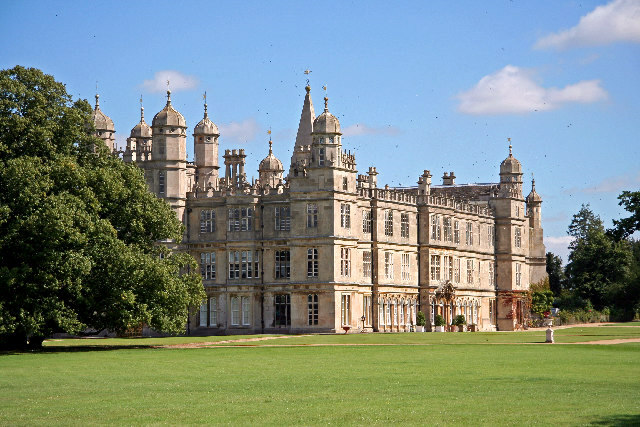 Burghley House sits in 300 acres of deer park, home to a large herd of Fallow Deer which was established here in the 16th century. It is also home to the annual Burghley Horse Trials, a four day equestrian event. 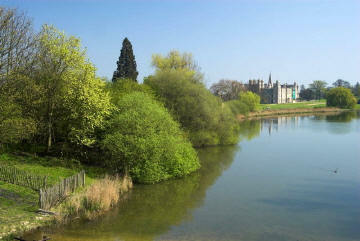 It is a grand 16th-century English country house near the town of Stamford and its park was laid out by Capability Brown. The Lincolnshire county boundary crosses between the town and the house which is located in the City of Peterborough unitary authority, Cambridgeshire. Burghley was built for Sir William Cecil, later 1st Baron Burghley, who was Lord High Treasurer to Queen Elizabeth I, between 1555 and 1587 and modelled on the privy lodgings of Richmond Palace. It was subsequently the residence of his descendants, the Earls and Marquesses of Exeter, and is now owned by a charitable trust established by the family. Within the house there are 35 major rooms on the ground and first floors of which there is a suite of rooms remodelled in the baroque style. There are also more than 80 lesser rooms and numerous halls, corridors, bathrooms and service areas. Although the house was built in the letter 'E' shape, in honour of Queen Elizabeth, it is now missing its north-west wing which was demolished and along with the south front roof line raised to allow better views of the new parkland being designed under the guidance of "Capability" Brown. 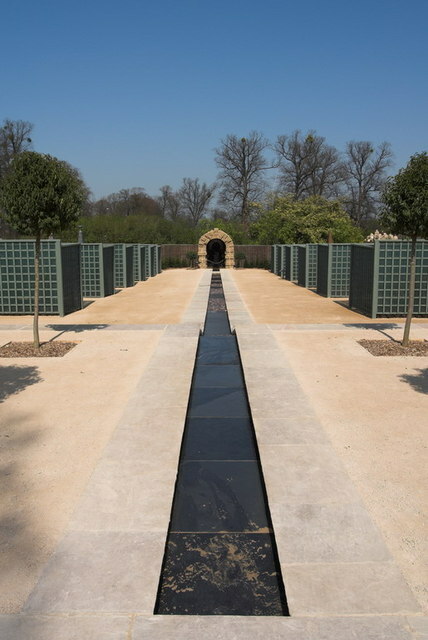 The avenues in the park were all laid out by Capability Brown, paying due respect to pre-existing plantings, some of which were from the 16th century or earlier. Brown also created the park's man made lake in 1775–80. He discovered a seam of waterproof "blue" clay on the grounds, and was able to enlarge the original 9 acre pond to the current 26 acre lake. Its clever design gives the impression of looking at a meandering river. Brown also designed the Lion Bridge, originally, Coade-stone lions were used as ornamentation but these perished, and the existing stone examples, made by local mason Herbert Gilbert, have been in place since 1844. Within the house a set of state rooms within the house which includes; the kitchen, the blue silk bedroom and dressing room, the George rooms and the Heaven Room and Hall staircase. 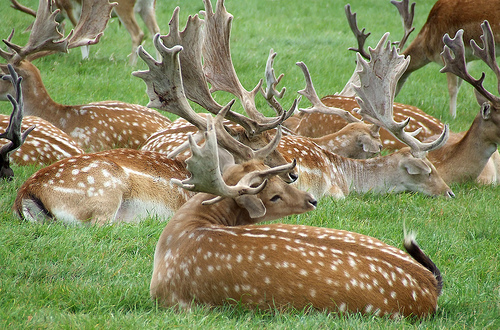 Within the grounds and gardens you can see a lake, large herd of fallow deer and The Garden of Surprises which is hidden inside a Yew hedge is an experience that will delight the senses. It incorporates a contemporary sculpture garden with specimen trees and shrubs, and the Elizabethan Garden which is over an acre of yew mazes, revolving Caesar's heads and spurting fountains, within here mirrors exaggerate, mazes confuse, squirts of water distract, the dank moss house captivates, transforming sculptures dazzle, the grotto entices and the longitude dial educates. Fifteen acres of reclaimed scrub woodland has been planted and contains mown paths and a lakeside walk. The lakeside walk you may see and hear some of the resident water fowl which include, Barnacle and Canada Geese, Heron, Mallard, Mandarin Duck, Pochard, Grebe, Coots and Swans. The lake it gives an impression of a meandering river across which is the Lion Bridge with its bridge gates and 'dog door' which allows hounds to get through from either direction at speed. Walking away from the bridge following the tarmac road will take you through the area used by the Horse Trials and at the junction of the drives is where you may glimpse the resident fallow deer, the fawns are born in June/July. They also open up their private gardens in April for the display of spring bulbs. North of Peterborough on the A1. At the Stamford roundabout turn right towards Stamford, go past the impressive Bottle lodges entrance gates, just past the A43 on left, turn right after the Bull & Swan Pub, continue for 1 mile to the visitors entrance. Seasons tickets to house and gardens also available. Special Needs Access: Chair lift to Orangery Restaurant, house tour has 2 staircases one with lift. Special Needs Facilities: Disabled toilet available. Dogs Allowed: Not allowed in house. Allowed in park on leads.